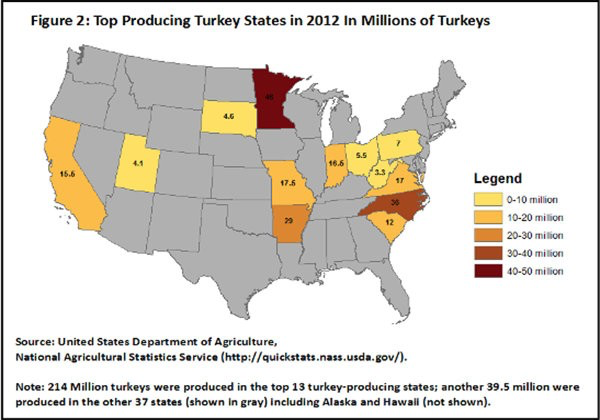 While the distribution of outbreaks seem slightly removed from centers of turkeys raised, the small number of cases may map on to the pronounced concentration of turkey farms not in terms of compromised animal welfare but of public health compromises in the concentration of factory farms–a sort of return of the repressed, rooted less in animal welfare than health concerns. The administration of antibiotics in the intense breeding of turkey meat may raise huge health risks among their human consumers–as if the translation of meat from farm to oven to table was elided in the aqua tones of the original CDC chart. 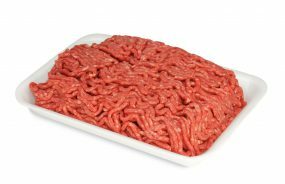 While the concentrations don’t correspond to the sites of farms–why should they?–the appetite for ground turkey, turkey cat-food and other turkey sausage products seems to correspond to centers of population, or a far more individual geography of the preparation and storage of meat. The numbers were small. But in adopting an alarmist coloration for the infographic, WaPo ramped up the colors of the CDC’s turquoise-blue graphic of individual outbreaks of a handful of multidrug-resistant Salmonella strains, found both in live turkeys and raw turkey products, in a turkey-flesh light cadmium hue, uses a spectrum of underdone meat to tap into seasonal fears. Increased outbreaks seemed to stain the union at a sacrosanct holiday feast of ostensible collective unity. The nation’s body and identity seemed under attack at its annual celebratory feast. Even if the infographic was essentially a cautionary reminder not to eat raw turkey meat–and to wash one’s hands–its point overall geographical dispersion of cases of infection was disturbing precisely because it lacked bounds; it couldn’t help identify a single supplier that could account for the outbreak. The apparent inability to contain the spread of such an outbreak given how widely our turkey is trafficked and the inability to map the vectors of transmission–as well as the fears that such an infection would jump species. And at a time when increased Americans handle raw turkey meat–and may be handling or running the risk of handling raw meat as they thaw their birds—using the very colors few hope to detect in the birds they eat; even if the data so far seems to derive from consumption of ground meat, it certainly made one think of the health benefits of laboratory-made meat in a food system whose distribution chain isn’t so smoothly working, and indeed makes us yearn for the laboratory settings “clean meat” promises by cellular agriculture, in which the largest poultry providers are indeed investing–and has led historian Benjamin Aides Wurgaft to undertake an anthropology of the future of meat and the cultures of “woven” lab-synthesized meat. But the problems of alternatives to slaughtered meat remind us of how much no companies can provide the scale of the demand for meat, or the structures of food production that the map enjoins us to come to terms. 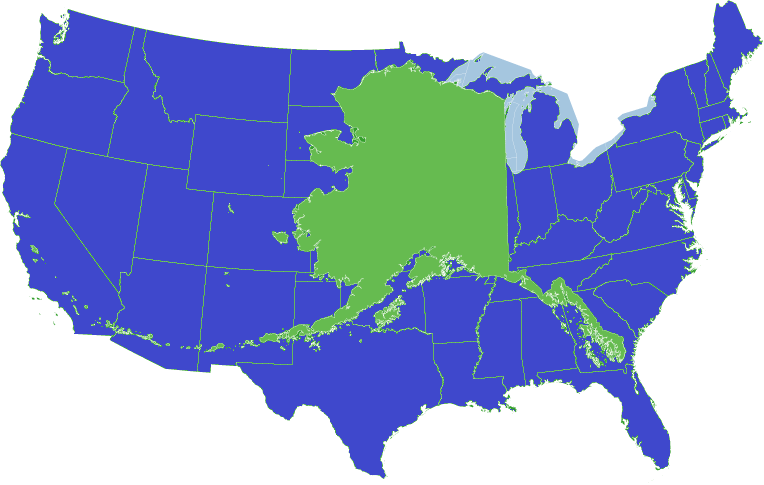 The map didn’t help suppliers or the FDA to pinpoint the place in the production chain where several batches of ground turkey–suspiciously dated 9/11!–met their markets in the form of pet food and other turkey products, and caused cascading alarms about identifying the spot in the supply chain at which the stain emerged, and hinted at the possibility of drug-resistant mutations. The possibility that the strains were exposed to Salmonella in the factory farm environments, and the cleanliness of their houses; moreover, the use of dead Salmonella bacteria to prevent a turkey’s susceptibility to infection fail to initiate the sort of cell-mediated immune response that would prevent the birds from becoming vessels of Salmonella pathogens. 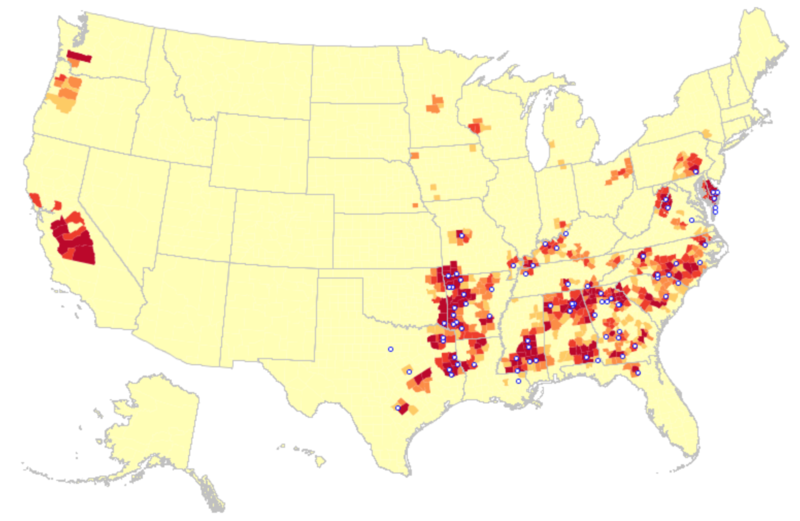 Is the outbreak the bounty of factory farms? 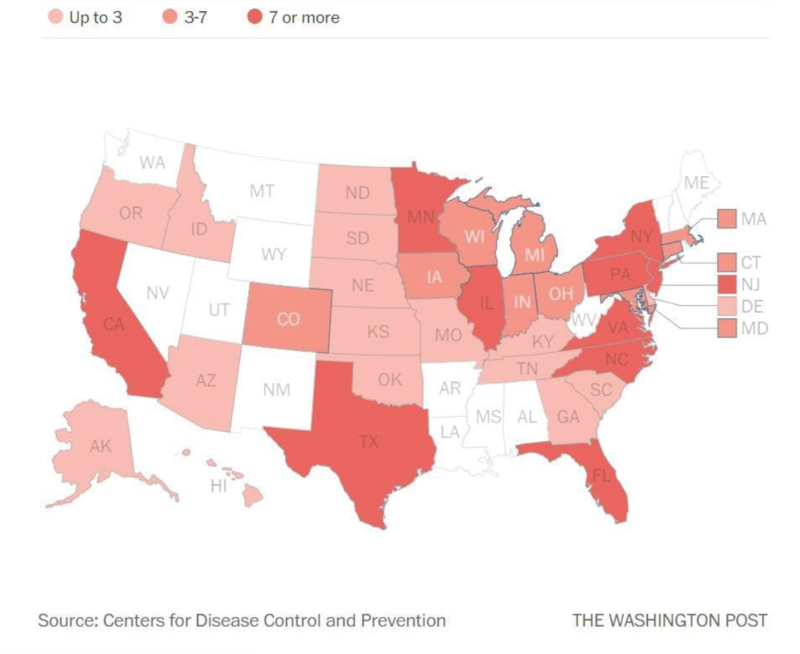 The cartography of alarm echoes the multi-state outbreaks of multidrug-resistant salmonella outbreaks in 2018, ranging from raw chicken products in twenty-nine states of Salmonella infantis, a past outbreak of Salmonella Adelaide in pre-cut melon across nine states from Missouri to Michigan, or the strain in chicken that infected seventeen across four states from New York to Virginia, or the Salmonella Newport in ground beef tied to JBS Tolleson, and lead to a recall of some fifty tons–or nearly seven million pounds– of raw ground beef in Tolleson, Arizona, where it was sold by multiple distributors. Elevated fears perfectly synchronized with the arrival of Thanksgiving have also assumed the psychic proportions of staging of a foreign microbial attack, by raising the possibility of an infectious strain inhabiting the family meal table. Recalled foods seem something like a new feature of Thanksgiving , as if collectively addressed government notifications are a new–almost Orwellian–form of giving thanks, and take caution in their license for unbounded culinary consumption. Just two days before the holiday banquet when we affirm our collective ties, we received not only a bulletin to avoid romaine lettuce, a potential cause of sudden kidney failure, subtracting Caesar salad from most menus, and raising fears of food safety that comes from the The alarm raised by the CDC occurred, to be sure, shortly after the nationwide recall of 6.5 million pounds of raw beef, based on the infection of fifty-seven individual patients across sixteen states, mostly concentrated in the south–Tennessee, Alabama, and Ohio. But while these foods are more traceable to individual sources of infection, the case of turkey meat is more haunting, given the timing with which an increased number across the nation plan to be handling raw turkey meat and cleaning bird cavities, prompting alarms about hand-washing and defrosting that run against the American grain by disrupting the Norman Rockwell image of the family feast. 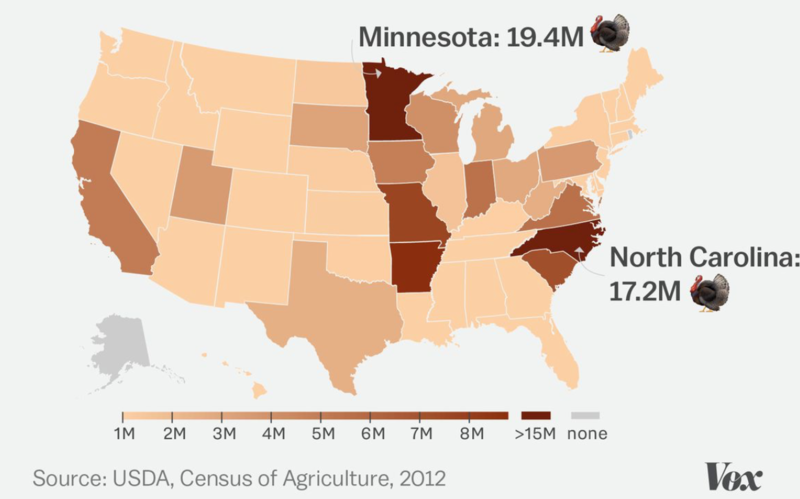 The disruptions seem to be traced to the increased crowding of factory farms–the very sites that could have such tremendous geographical reach–where factory farms for poultry in northeast Arkansas and North Carolina, as well as Minnesota, create something like potential breeding grounds for drug-resistant strains. But the revelation of a spate of infections apparently widespread in the turkey industry created a real headache not only for butchers, but a level of panic among the general public, with legs to travel across the nation. Multi-drug resistance seems present in live turkeys and in many types of raw turkey products, raising fears that it might be widespread in coming days. 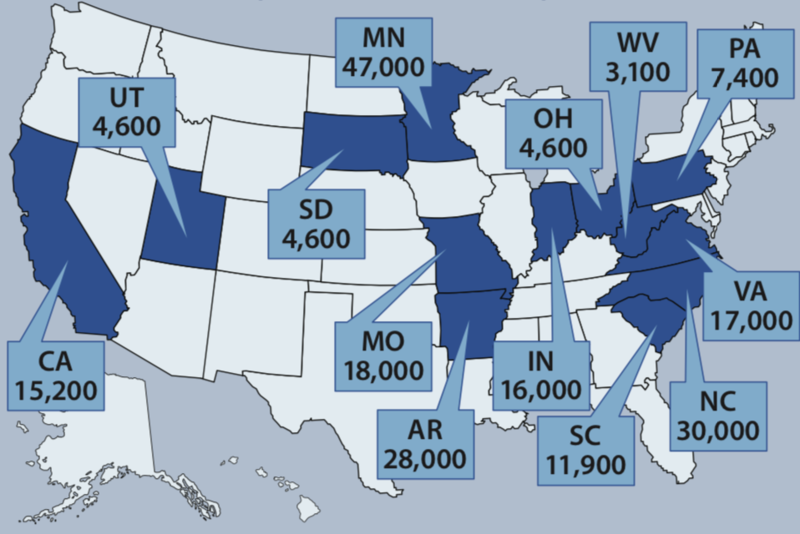 The proportion of incidents of salmonella poisoning may roughly show the population size of states, although it wouldn’t be surprising to see many originate in the North Carolina-Virginia area, given the preponderance of a concentration of tragic outbreaks of poisoning there, even if we don’t have the source of the outbreaks in any detail. 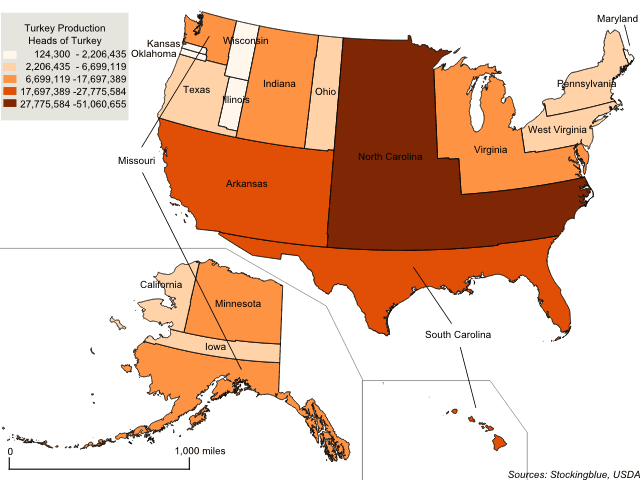 The mapping of outbreaks onto areas of the greatest production of heads of turkey in the US remind us of the predominance of North Carolina, as a site of turkey farming, contributing a quarter to the entire nation, at up to 50,000,000 heads, as well as Virginia, contributing over 9 per cent of the total birds consumed–suggesting a preponderance of factory farms, and probably very few free range birds–and some 10 million in Virginia (7,000,000-17,000,000), suggesting just how widespread the taste for turkey is this time of year, and how difficult it will be to dissuade supermarkets from stocking the birds. The tentative chorus heard around tables–“It might not be all the way cooked through”–might constitute a preliminary to digestive disturbances undermining after-dinner tranquility or day-after turkey trots. The warnings of Salmonella outbreaks are hardly new in the nation. 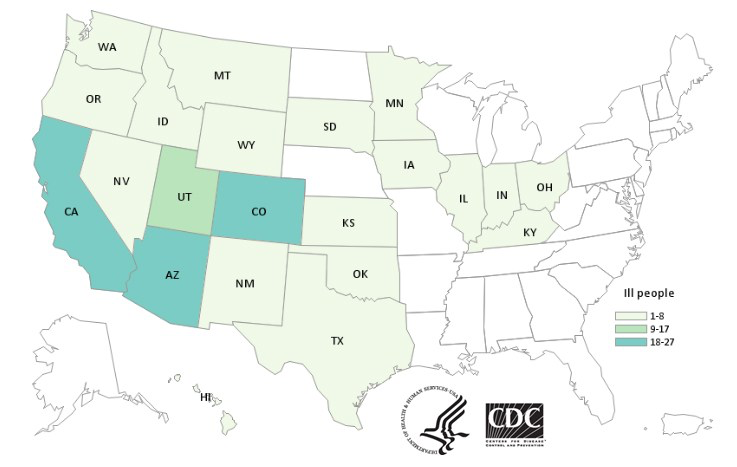 The flood of antibiotic-resistant multi-state outbreaks of Salmonella this year ranges widely across the country indeed, if one follows websites like Contagion Live, which lists active outbreaks of Salmonella in a flood of intensifying shades of violet–in ground beef, raw chicken, cake mix, cut melon, eggs, and pig, as well as thirty-seven outbreaks of Salmonella came from”raw turkey”–words reflexively prompting anxious testing cooked turkeys’ internal temperatures as they exit from ovens, before being carried as an offering to the Thanksgiving table, a phrase triggering probing turkey thighs with cooking thermometers, trying to gauge the crossing of that 160º threshold of internal temperature, probing farthest from the crisped skin. 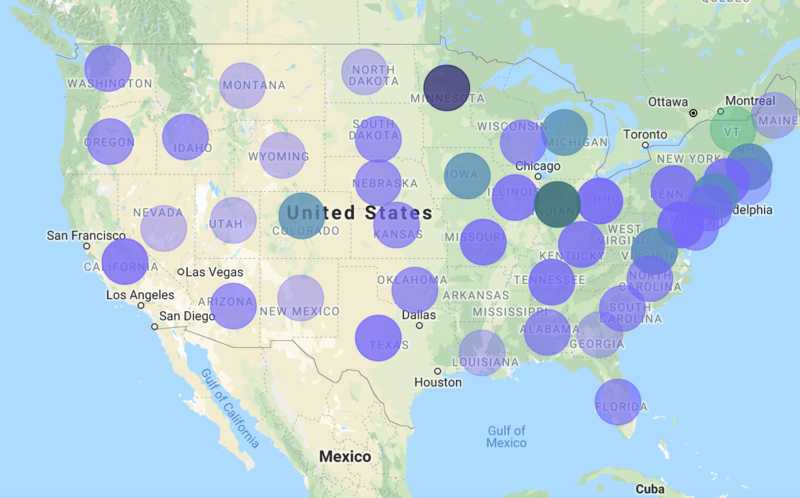 The spread of Salmonella outbreaks, here shown in deep or light purple circles, seem disturbingly diffused from Minnesota, though the spread should be most alarming, if one follows the breakouts mapped on the website Contagion Live. 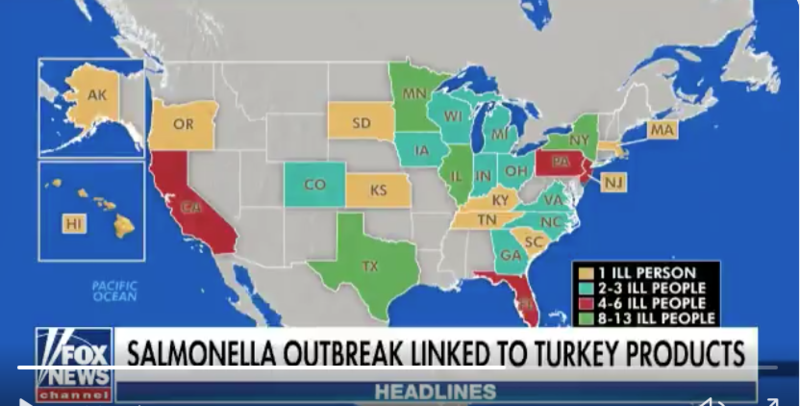 A term that in itself, in November, is bound to set off nation-wide alarms, at the possibly impurity of that national celebration of thanks, which seems defiled, even on Fox, even if it was hardly ever really that pure–used banner headlines to describe a “breakout” sickening ninety across the country resulted from what “CDC officials have traced Salmonella to a variety of good including turkey products, pet food,” as if the “breakout” were akin to an attack on our national institution that our national agencies are on top of, in a world where signs of dangerous microbes seems to have become an almost patriotic exercise. 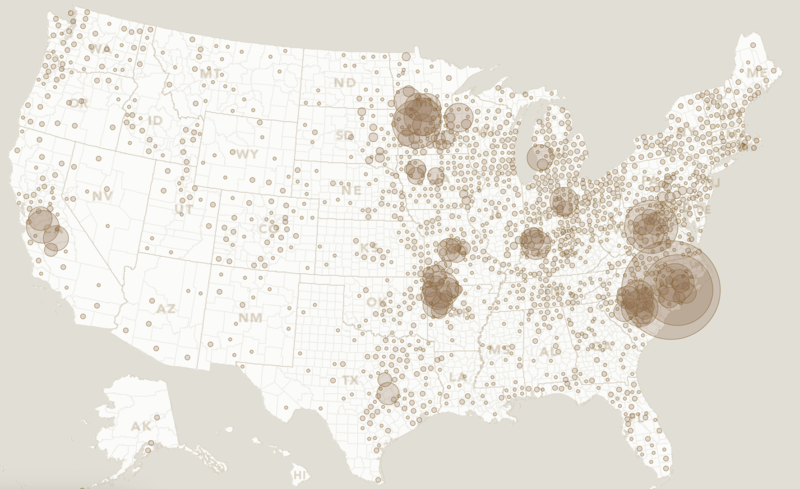 The alarmist cartography of early outbreaks of hospitalization seemed painted as if to threaten the sanctity of the institution of carving our family birds, interrupting family holidays at a majority of states, sidesteps the questions that might be raised of crowding turkeys raised for holiday consumption in as many as 10,000 crowded in a single building, or the difficulties of rapid breeding, tied to our growing holiday demand, on turkeys that suffer increasing health complications or disorders as they are bred to grow so much larger that they can now no longer naturally reproduce, although one is only really “mapping” the reporting of hospitalized individuals. The concentration of these fowl in factory farms is striking, and should raise fears about the migration of those raw turkeys to our dining tables, even if the outbreaks seem more commonly associated with pet food and “turkey products” as the concentration of who supplies us with meat seems so disproportionately weighted to a few states whose farms almost certainly serving as effective laboratories of microbial mutation developing resistance to antibiotic-laced feed, as the number of turkeys raised at poultry farms has grown since 2010, based largely on two genetic strains alone–Aviagen–formerly “Nicolas”–Turkeys and Hybrid Turkeys, from the old farming town Kitchener, Ontario. Aviagen is the premier provider of breeding stock, and while offering a range of genetic lines, the more limited number of breeders has led to a range of vaccines–often to combat infectious bronchitis and its multiple variants–leading them to replicate, as Salmonella vaccines. The difficulty to break habits of roasting turkeys for the Thanksgiving table are steep. ESRI offered a far more detailed geographic breakdown of each plate of the meal, in a story map using 2017 Dept. of Agriculture numbers for a more finely-grained network, suggesting the sea of turkeys from large factory farms in the southern states from North Carolina, South Carolina, and Arkansas, suggesting a crazy crowding of turkey suppliers in certain a few states that provide the feasts for tables across America, whose flow lines one can only imagine mapping, with shipped frozen traveling from a few large centers of raising birds destined for Thanksgiving banquets, in a sort of story map that documents the origins of the geographic distribution of elements united in the Thanksgiving meal. Although Minnesota boasts the largest hatchery company of turkeys in the world, able to fill the national appetite through a year-round supply of soybeans and corn, the 244 million birds raised in 2017 have grown to over 250 million to feed the national appetite.